JACOB Hopper’s outstanding start to the season has been rewarded with a new two-year contract at Greater Western Sydney. Hopper’s current deal with the Giants was due to expire at the end of this season, but the GWS academy product is now tied to the club until at least the end of 2021. Despite three seasons plagued by injury and illness, Hopper has been an integral part of the Giants midfield since he gathered 32 possessions on debut against Gold Coast in 2016. 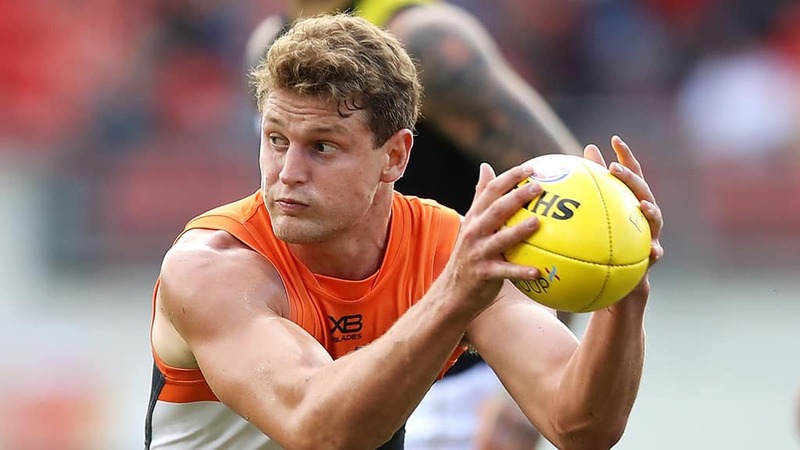 The 22-year-old has taken on more responsibility in 2019 after the departures of Dylan Shiel and Tom Scully during last year’s NAB AFL trade period, and early season injuries to Josh Kelly and Callan Ward, and he’s responded by averaging a career-high 27.5 disposals, six clearances and six inside 50s per game. With the troubles with his body finally in the past, Hopper said it was an easy decision to maintain his commitment to the Giants. “I feel really responsible for the team and how we go on game day, and the love and care amongst the group makes it the closest group I’ve ever been involved with,” he said. “It’s something really special and I’m really looking forward to digging in for the next few seasons. Hopper joins teammates Nick Haynes, Harry Himmelberg, Adam Kennedy and Matt de Boer in striking a new deal with the Giants, but the club still hasn’t managed to secure the marquee signatures of star midfielders Josh Kelly and Stephen Coniglio. When Hopper spoke to AFL.com.au early last year, he spoke about how happy he was that the intense speculation over Kelly’s contract the previous season had helped him avoid the media spotlight regarding his own future at the time. He joked that his close mate “probably took a couple of bullets” for him, but he couldn’t resist a sly dig at his fellow onballer this time around. “With what happened two years ago, enough was enough with ‘Chook’ (Kelly), he was just taking all the spotlight, so I though bugger it I’ll beat him to the punch (this time),” he said with a laugh. “But I’m close with both of the boys, I know that they’ve got extreme passion for the football club and they’ll make a decision when they see the timing is right. Hopper’s influence as a midfielder takes on even more significance after Ward underwent a knee reconstruction on Tuesday, ruling him out of action for the rest of the season. While the co-captain is yet to sit down with the club to settle on his off-field role with the team going forward, Hopper confirmed he will seek out his injured skipper when he returns to the club for some mentoring for the remainder of the year. “I think Wardy is someone who has helped me from day one and someone I know will continue to help me throughout my entire career both on and off the field,” Hopper said. “He will probably want to do it as well because it will keep him a busy and while he’s going through the rigours of rehab.